This entry was posted in Africa Data4dev Ghana ICT4D Information and Communication Technologies Living Labs Regreening University for Development Studies on May 6, 2015 by Anna Bon. 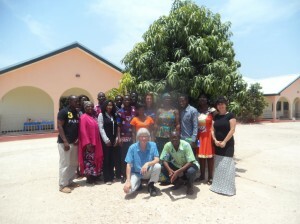 Professor Hans Akkermans lecturing in Walewale to a team of UDS researchers. farmers, to enhance and support Food and Water Security in the Sahel. Based on an extensive needs assessment, a set of innovative, suitable, and highly contextualized ICT solutions will be co-designed and deployed, according to local goals and jointly defined requirements. The UDS team consists of a multi-disciplinary group of experts in rural economics, animal science, tropical agronomy, irrigation, microfinance, sustainable land management, gender, value chain development and ICT4D. 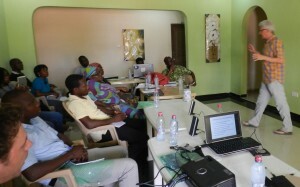 The approach used by the VUA-UDS team in this workshop is based on the Living Lab methodology. It consists of extensive field research, visits and focus group discussions with rural communities, brainstorm sessions, demos and roadshows in rural Africa. During this week we visit the village of Guabuliga, east of Walewale, a community of about 2000 inhabitants who live from rain-fed agriculture and livestock. We have been here before, in December 2014. The idea is to bring people together from various disciplines and cultural backgrounds. The variety of people, expertises, experiences and viewpoints is needed when tackling such a complex research project. The topics are split into four major categories: Irrigation, Eco-systems, Microfinance and Livestock: these are all important issues for farmers in northern Ghana, and many problems are related to obstacles in information sharing and access to knowledge. Prof. Saa Dittoh is specialist in rural development. His knowledge of the local context is important to understand ICT4D and build relevant systems. le. Lack of transport makes it challenging to visit the local market bringing your products with you. You want to know the market prices before you hit the road. Market prices of products such as maize, millet, rice, onions, vegetables and livestock are very volatile, and fluctuate according to the supplies and demands. Vegetables and other perishables are the most volatile: their price can fluctuate over the day. Suppose you want to sell your goat? How do you define a price , if you don’t even have a balance in your village to measure its weight? Sales persons, also referred to as market queens buy the products from the farmers. Farmers are not allowed to contact end-consumers directly, so these retailers have a strong position on the market. The farmers we met in Guabuliga would be happy to have a market information system, informing them about the actual prices on different markets, different crops, different seasons. For VUA this workshop is also part of the ICT4D master course for students Computer Science, Information Science and Artificial Intelligence, which is currently taking place at the VU. The students in Amsterdam have studied use cases that were collected during previous field visits to Ghana, and have prepared prototypes of voice-based information systems , which are now demo-ed to the UDS participants, during the workshop. The student projects include knowledge sharing information systems about crops and agriculture systems; market information systems in Ghanaian local language Twi; farmer helpline services based on voice; rain and meteo services. In the discussions here in Ghana it becomes clear that the ICT4D ideas are very relevant, but improvement of the use case involves a lot of discussion. ICT4D systems are only useful if they are specific, contextualised and user-friendly, and if they provide exactly what the user needs. We knew this already from requirements engineering and software engineering practices in western countries, but here the absolute need for a thorough requirements analysis is more than obvious. The blackbox or Kasadaka is an inexpensive voice-application server, developed specifically by the VUA team for rapid prototyping under rural conditions. runs Asterisk. Asterisk is a free and open source framework for building (voice-based) communications applications. The cost of this hardware device is currently about 100 EUR. The KasaDaka is tested under rural conditions: which includes: no internet connection, temperatures of up to 42 degrees Celsius in the shade, regular electricity outages, local mobile networks, local African languages. The ICT4D student projects will be made available by phoning into the KasaDaka. 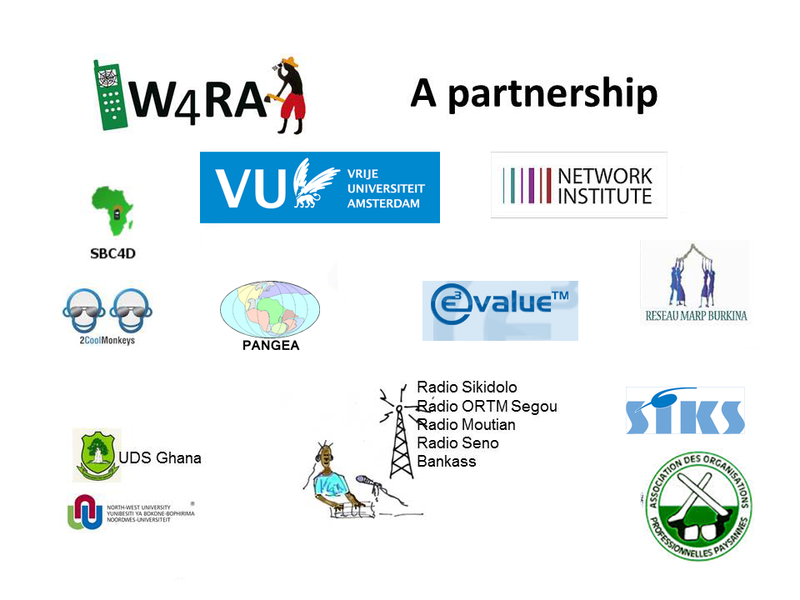 The results of the workshop and the student projects, will be presented at the ICT4D symposium of 22 May 2015, but science is not the only purpose. The systems will be further developed for the rural context, not just as a proof of concept, but to serve the needs of local farmers in the Sahel. This is also relevant for research, because the proof of the pudding is actually in the eating. Moreover, there is still a lot to learn about deployment of e-services in rural Africa, spread of technological innovations in low-resource environments etc . One of the applications ideas we brought into the workshop is the DigiVet, or Digital Veterinary Service, designed by Gossa Lô, bachelor student Lifestyle Informatics from VU and one of the Network Institute Academy Assistant. Gossa did her fieldwork in Ghana, with her peer Myrthe van Der Wekken, a master student from Social Sciences , and they spent a few weeks in Zalerigu, a small town near Bolgatanga. Gossa and Myrthe were supervised by Dr. Julie Ferguson ans Dr. Stefan Schlobach and during their stay in Ghana, co-supervised by UDS professor Saa Dittoh. The name of their joint project is Knowledge Sharing for the Rural Poor. Gossa’s animal’s health decision support application will allow farmers to diagnose common livestock diseases and take action, based on local veterinary knowledge and a decision tree. 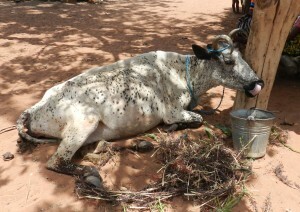 Livestock in Guabuliga is used as a sort of life insurance. When your crop fails, you can bring your cow to the market. Currently, in Guabuliga, a serious animal disease is affecting livestock. Every day a cow is dying, since a few weeks, and the farmers do not have the means or knowledge to prevent this. Any support to bring knowledge, or connect them to existing veterinary knowledge would be welcome. ‘The DigiVet is a visual and voice-based application, that requires no reading and writing skills – the majority of the population in Guabuliga is not alphabetized. A central coordinator for this service will be identified in the village. UDS animal researchers will provide the knowledge on animal health to build the application. The end-users in Guabuliga will test and validate the first prototype, to make sure it is useful for them. Extensive field testing will ensure robustness of the system. A solution will be sought for the business aspect. A local person must be able to provide support for the system, and will receive a payment in return. The whole system must be easily adapted (e.g. to new health information or to support a new language) and must be affordable in the local, low-resource eco-system. Familily picture of UDS and VUA staff in Walewale. Francis Dittoh, one of the UDS researchers who finished his masters Computer Science at VU in 2014, is starting his PhD research, on a topic related to ICT for Food Security and rural development. He will be supervised by Prof. Hans Akkermans. This workshop, which is sponsored by the Dutch Development Agency Nuffic, in the NFP-NPT-program, is also a start for the DATAfrica project, a larger-scale research collaboration of VUA , UDS and other partners in Africa and the EU, aimed at the innovation in community-centric data services in rural Africa. This project is currently being prepared. To be continued…..